Changing the oil weight will make no difference. The damping oil is contained in the sealed DDC cartridge in the left fork leg. The oil you can access is there for lubrication and to set the air gap only. And I still don’t get the BMW sag measurement method. Preload affects the static sag value. Fork spring stiffness affects the difference between rider sag and static sag. Happy for someone to explain what I’m missing there! 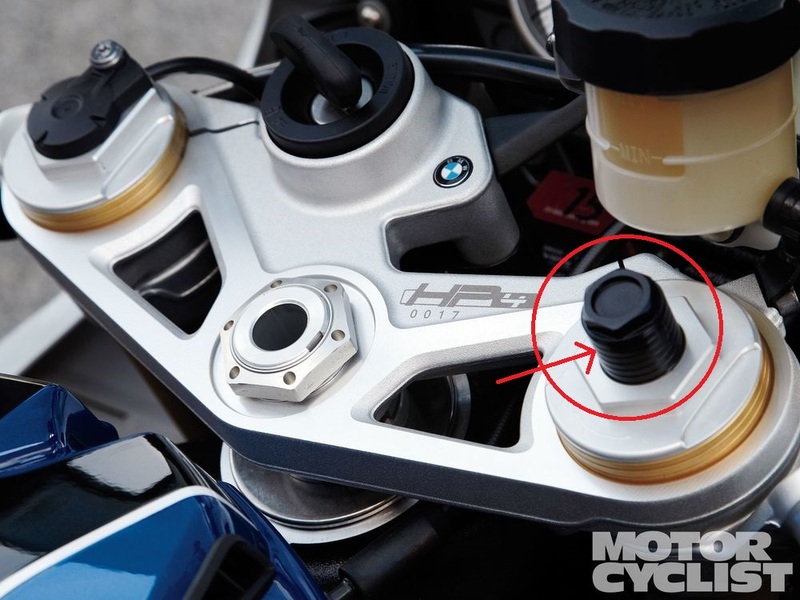 The preload adjuster on bikes with DDC is found on the right fork cap. It's the black hex (15mm?) adjuster w/ rings on the cylindrical tube. Those rings indicate your front fork preload position. If you spin it clockwise you increase preload which decreases sag (makes bike sit higher) - counterclockwise decreases preload which increases sag. Your adjuster would be broken if it just spins and the number of rings doesn't increase or decrease. At either end of the range you should reach a stop point. I believe from factory the bikes come with either 5 or 6 rings showing in the front but for whatever reason the adjuster hardly affects sag. The first time I tried to set mine I thought it was broken cause I kept turning it and nothing happened to my sag numbers. You may have to spin the adjuster quite a bit to notice any measurable changes. Go for a 30 min ride with a friend, come back and measure your sag numbers in mm with the bike on, level, set to soft / 1 up, and with you off and then on the bike front and rear. From there calculate the difference between static and rider sag and figure out if your in spec or not. Adjust the preload knob's 2 turns at a time till your in spec & then fine tune it (anywhere in the range should do just keep it consistent). If you get to the end of your preload adjustment range and your still out of spec you'll probably need a respring and maybe an oil viscosity change to support that since revalving isn't possible on the R w/ DDC as far as I know. I honestly have no clue. Maybe someone else will chime in with their settings or maybe try and search around i've seen a few posts on here with settings that will work. My settings are off right and I won't be able to measure my sag for about two more weeks or I'd give you mine. And I still don't get the BMW sag measurement method. Preload affects the static sag value. Fork spring stiffness affects the difference between rider sag and static sag. Happy for someone to explain what I’m missing there! Hmm that is really odd. I guess I always assumed it was like an automated regular fork where the dampening valve pulled from the main reservoir rather than a closed system. The service disk says SAE 7.5, Left Leg: 215ml / 75 mm gap, and Right Leg: 560 ml / 80 mm air gap (non ddc is 560 / 80 left and 580 / 80 right) so that would confirm what your saying about the ddc using a separate sealed chamber and I just read some more BMW lit that also confirms this. In that case changing fork oil weight probably won't do much and same with changing the air gap. There really isn't much you can do besides a respringing with a similar rate. I'm not sure why the R model got shafted in production but it would have been nice if BMW had just carried over the menu adjustability from the RR for some semi-manual control of the dampening rate rather than having it be mode specific and completely fixed. That might allow you to match the dampening to a large spring rate change or at least you'd be closer. But ya the BMW sag method is extremely strange. It's weird that you would be only measuring rider sag rather than the traditional method of rider/static/total. It actually doesn't make much sense now that I've thought about it more. Also the BMW manual language makes it seem like the given target sag figures might only apply to an 85 kg rider and not to other weights. My only guess would be that if you manage to get the bike in the correct rider sag range then your static and free sag measurements will be correct as well. Bike to bike there will be some variation in this but maybe that's why a range is listed rather than a fixed target. I'm not sure why the R model got shafted in production but it would have been nice if BMW had just carried over the menu adjustability from the RR for some semi-manual control of the dampening rate rather than having it be mode specific and completely fixed. That might allow you to match the dampening to a large spring rate change or at least you'd be closer. Probably one of the reasons why the R is substantially cheaper than the RR. Now we just need someone to crack the code and get all of that adjust-ability and other functions/display available to the R.
Bikes with DDC, must have bike running and in Road mode to set sag front and back. As per manual. For an additional note, it says the bike should be set for solo as well (not 2 up), fairly obvious, but some people may have been in 2-up riding and have forgotten.